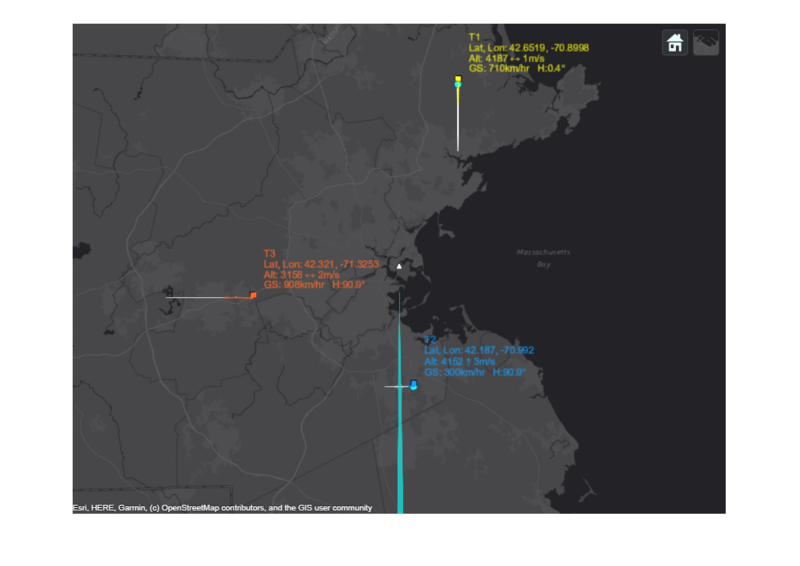 This example shows how to generate an air traffic control scenario, simulate radar detections from an airport surveillance radar (ASR), and configure a global nearest neighbor (GNN) tracker to track the simulated targets using the radar detections. This enables you to evaluate different target scenarios, radar requirements, and tracker configurations without needing access to costly aircraft or equipment. This example covers the entire synthetic data workflow. Simulate an air traffic control (ATC) tower and the motion of the targets in the scenario as platforms. Simulation of the motion of the platforms in the scenario is managed by trackingScenario. Create a trackingScenario and add the ATC tower to the scenario. Model the ASR with the above specifications using the monostaticRadarSensor. Tilt the radar so that it surveys a region beginning at 2 degrees above the horizon. To do this, enable elevation and set the mechanical scan limits to span the radar's elevation field of view beginning at 2 degrees above the horizon. Because trackingScenario uses a North-East-Down (NED) coordinate frame, negative elevations correspond to points above the horizon. Set the elevation field of view to be slightly larger than the elevation spanned by the scan limits. This prevents raster scanning in elevation and tilts the radar to point in the middle of the elevation scan limits. The monostaticRadarSensor models range and elevation bias due to atmospheric refraction. These biases become more pronounced at lower altitudes and for targets at long ranges. Because the index of refraction changes (decreases) with altitude, the radar signals propagate along a curved path. This results in the radar observing targets at altitudes which are higher than their true altitude and at ranges beyond their line-of-sight range. Add three airliners within the ATC control sector. One airliner approaches the ATC from a long range, another departs, and the third is flying tangential to the tower. Model the motion of these airliners over a 60 second interval. trackingScenario uses a North-East-Down (NED) coordinate frame. When defining the waypoints for the airliners below, the z-coordinate corresponds to down, so heights above the ground are set to negative values. 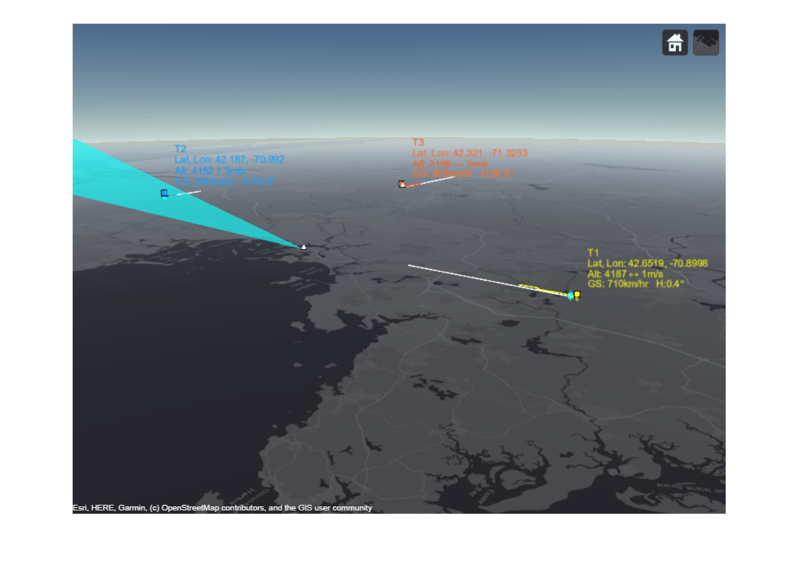 Create a trackerGNN to form tracks from the radar detections generated from the three airliners. Update the tracker with the detections generated after the completion of a full 360 degree scan in azimuth. The tracker uses the initFilter supporting function to initialize a constant velocity extended Kalman filter for each new track. initFilter modifies the filter returned by initcvekf to match the target velocities and tracker update interval. The following loop advances the platform positions until the end of the scenario has been reached. For each step forward in the scenario, the radar generates detections from targets in its field of view. The tracker is updated with these detections after the radar has completed a 360 degree scan in azimuth. Use helperATCExample to show the first snapshot taken at the completion of the radar's second scan. The preceding figure shows the scenario at the end of the radar's second 360 degree scan. Radar detections, shown as blue dots, are present for each of the simulated airliners. At this point, the tracker has already been updated by one complete scan of the radar. Internally, the tracker has initialized tracks for each of the airliners. These tracks will be shown after the update following this scan, when the tracks are promoted to confirmed, meeting the tracker's confirmation requirement of 2 hits out of 3 updates. 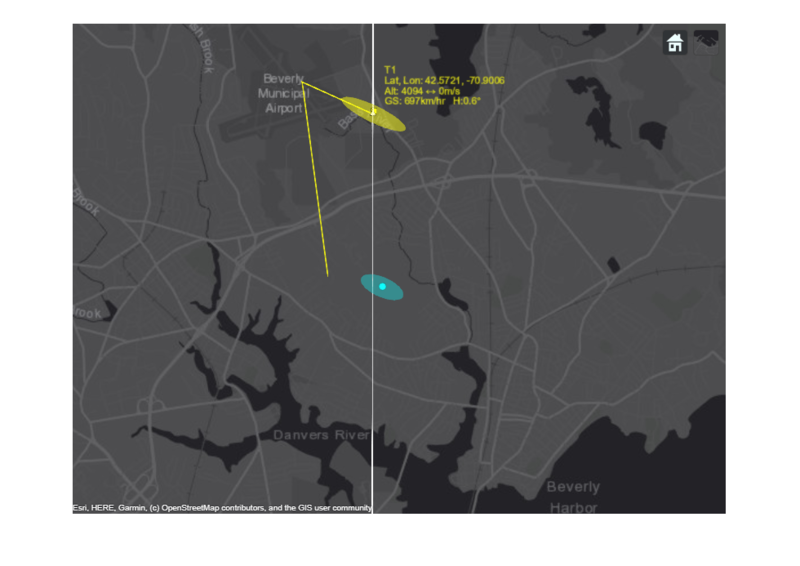 The next two snapshots show tracking of the outbound airliner. The previous figures show the track picture before (on the left) and immediately after (on the right) the tracker updates after the radar's second scan. The detection in the figure on the left is used to update and confirm the initialized track from the previous scan's detection for this airliner. The figure on the right shows the confirmed track's position and velocity. The estimated track velocity is indicated by the black line extending from the track's location. The uncertainty of the track's position estimate is shown as the gray ellipse. After only two detections, the tracker has established an accurate estimate of the outbound airliner's position and velocity. The airliner's true altitude is 4 km and it is traveling east at 700 km/hr. The state of the outbound airliner's track is coasted to the end of the third scan and shown in the figure above on the left along with the most recent detection for the airliner. Notice how the track's uncertainty has grown since it was updated in the previous figure. The track after it has been updated with the detection is shown in the figure on the right. You notice that the uncertainty of the track position is reduced after the update. The track uncertainty grows between updates and is reduced whenever it is updated with a new measurement. You also observe that after the third update, the track lies on top of the airliner's true position. The final figure shows the state of all three airliners' tracks at the end of the scenario. There is exactly one track for each of the three airliners. The same track numbers are assigned to each of the airliners for the entire duration of the scenario, indicating that none of these tracks were dropped during the scenario. The estimated tracks closely match the true position and velocity of the airliners. Visualize tracks in 3D to get a better sense of the estimated altitudes. 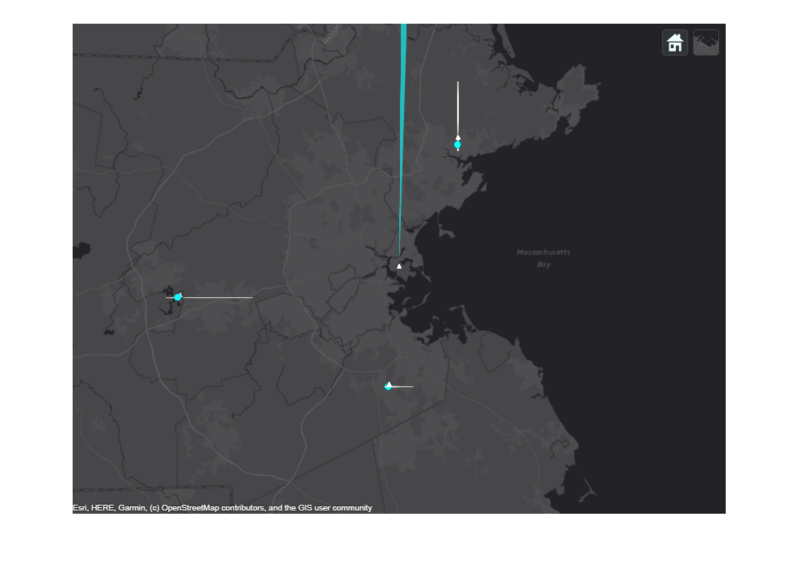 Plot the latitude-longitude of each track position in a geographic axes using geoplot. You can use the ned2geodetic function from Mapping Toolbox™ to transform track positions from NED Cartesian coordinates to geodetic coordinates. The latitude and longitude of all tracks are stored in the ATCExample.mat file. 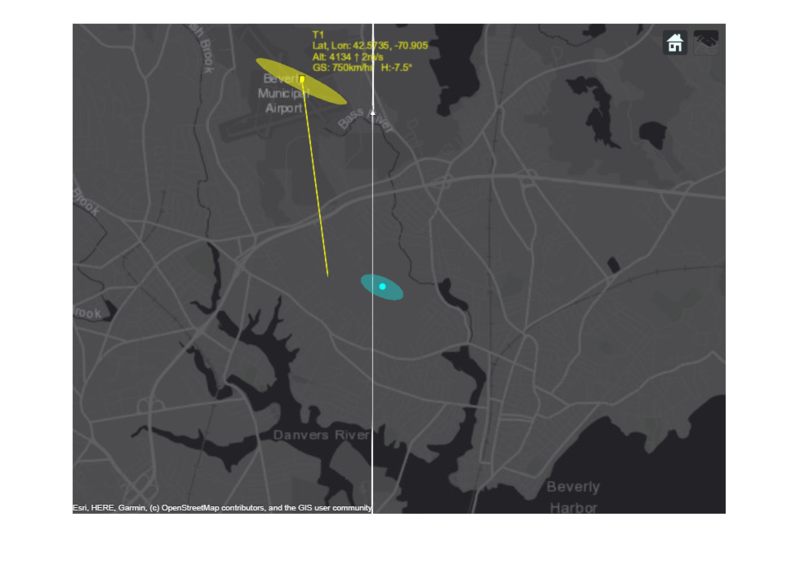 This example shows how to generate an air traffic control scenario, simulate radar detections from an airport surveillance radar (ASR), and configure a global nearest neighbor (GNN) tracker to track the simulated targets using the radar detections. In this example, you learned how the tracker's history based logic promotes tracks. You also learned how the track uncertainty grows when a track is coasted and is reduced when the track is updated by a new detection. This function modifies the function initcvekf to handle higher velocity targets such as the airliners in the ATC scenario. % for the initialized track's velocity noise.